The four tablets Asus showed off at CES today aren't just unusual form factors; they're also packing in performance. The 7-inch Eee Pad MeMO is a fairly standard Qualcomm Snapdragon-based 7-inch Android tablet, but like all Asus' Android tablets it will run Honeycomb and will come with a capacitive stylus and a Media Note application you can use for handwritten notes. It also has a MeMIC 'media phone extender' (which we'd usually call a stereo headset) and a price tag between $499 and $699 when it comes out in June. If you want a 10-inch Android slate, Asus thinks you'll want a keyboard to go with it. The Eee Pad Slider looks like various Intel concept tablet PCs of years gone by, with a keyboard that slides out from under the screen, but it still weighs in at just under two pounds and less than two-thirds of an inch thick. The slimmer Transformer has a separate keyboard that packs in enough batteries to give you a predicted 16 hours of battery life. There are also USB ports and a card reader, plus you can fold the keyboard over the screen to use it as a protective cover rather than needing a case. 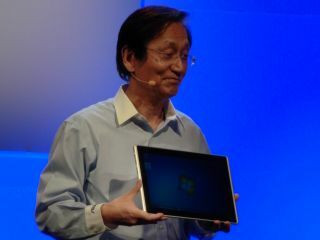 They both have a dual-core Tegra 2 processor, which Asus chairman Jonney Shih boasts has around twice the performance of the Apple A4 chip in the iPad and what he claims will be "the fastest Flash video performance". The Transformer starts at $399 (without the base station) or $699 with it and the Slider will sell between $499 and $799 for different versions (they'll be on sale in April and May). But Asus is also bringing out a 12-inch Windows tablet and unlike all the Atom-based tablets that are appearing, the Eee Slate EP121 has a mainstream processor in it; for $999 you get a Core i5 CPU, 64GB SSD, two-megapixel webcam, HDMI and a Wacom digitiser pen that means you could actually use the handwriting recognition built into Windows 7 Home Premium to write and send emails (plus an optional wireless Bluetooth keyboard). Shih claims it's "the most powerful tablet, with no compromises" and showed us Photoshop CS5 running with a 1080p copy of The A Team playing in the background. You don't have to wait as long for the Windows tablet either; it will be on sale this month as Microsoft pushes its partners to catch up with Android.